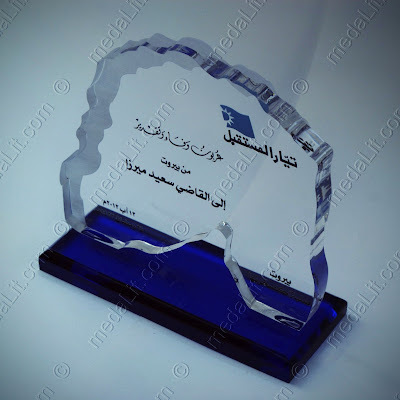 This wiki is an illustrated glossary of terms related to products categorized under awards, trophies, medals, plaques, signs, labels and certificates and their production techniques including: etching, engraving, laser engraving, minting, and metal sheets finishing. Our objective is to make the related terms and specifications explained and illustrated thus aiding our customers in making better decisions regarding their needs of products mentioned above. 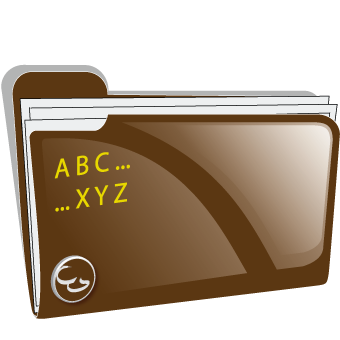 We hope that this wiki will be eventually developed into a reference about the subject matter. 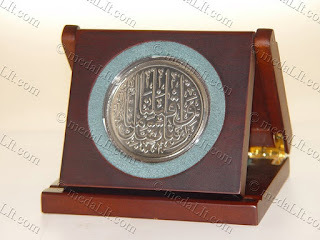 Metal etching is a technique of engraving a design on a metal surface (brass or stainless steel) using a corrosive solution (like ferric chloride or acid). 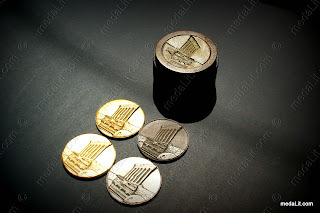 The metal surface is coated with a protective layer (like wax, resin or photosensitive compound known as photoresist), the design is printed on the protected metal surface (by exposing the photosensitive surface of the plate to a source of light or by other means), leaving the design areas of the metal surface striped from the protective layer. Upon engrossing the resulting metal plate in the corrosive solution the exposed areas of the plate surface will be eaten away by the corrosive compound to form an engraved design on the plate surface. 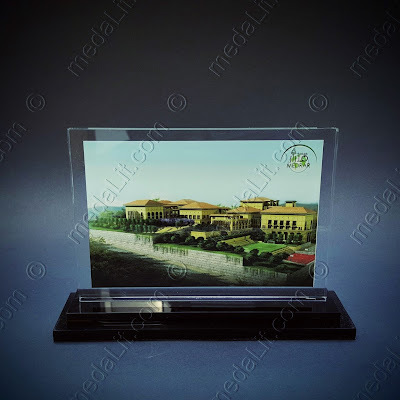 Engraved or sandblasted designs on acrylic sheets appear milky white or frosted, however these areas can also be color filled. Applying color on your award can be a great way to increase its beauty and value and may add a nice finishing touch to almost any engraved item. 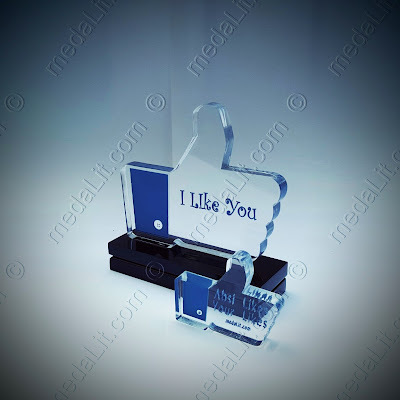 While frosted designs appear very beautiful on clear acrylic, color-filled designs is a necessity when colored acrylic is used. 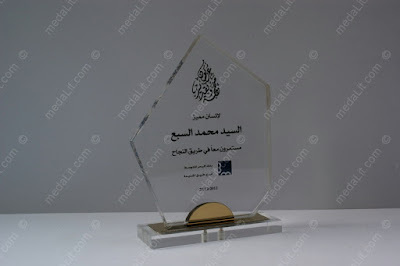 When the trophy is placed in front a dark background; frosted designs are preferred, on the other hand if the background is light; color-filled designs are favorable. 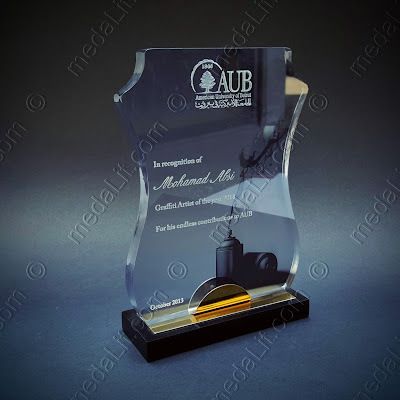 The cost of laser engraving an award is included in listed prices throughout our web site unless it is otherwise stated, however color filling will cost an extra charge. 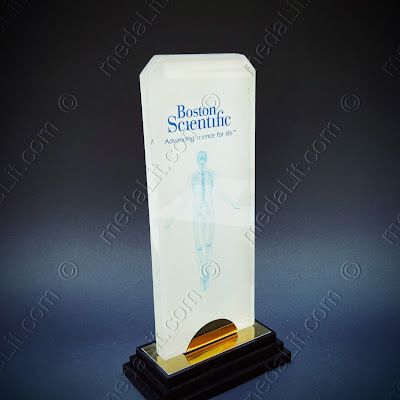 Solid surface printers can be used to print any design in full colors on the trophy body. 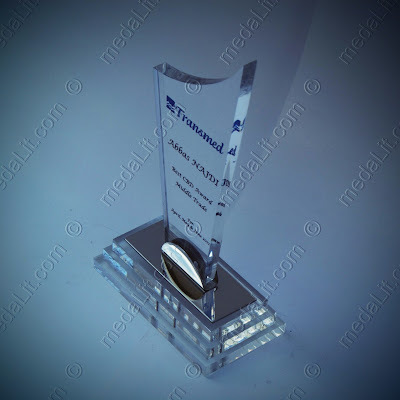 This opens an infinite number of possibilities for creative designs that can be printed on a display trophy reflecting your brand and the message you want to display. 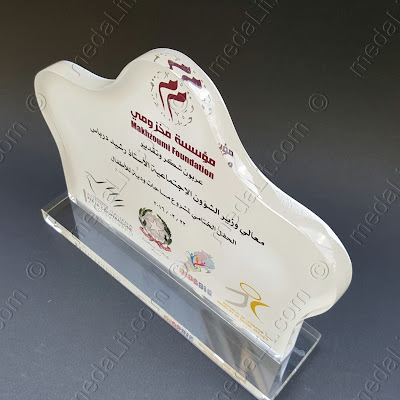 Both this technology and laser-cutting helped us to produce awards and deal toys better customized to match your branding or ideas. Laser engraving and solid surface printing can be combined to produce great dramatic effects such as producing a frosted engraved design on any printed pattern or colored design, see example below. 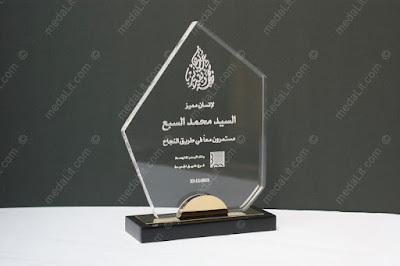 The cost of laser engraving or digital printing an award is included in listed prices, unless it is otherwise stated, however combining laser engraving and digital printing will cost an extra charge. 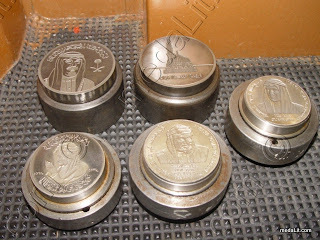 To stamp an impression on medals you need a steel stamping die. 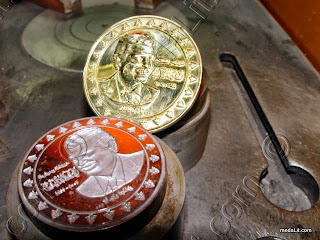 A stamping die is an engraved or etched tool, which is put into a coin press and impresses an image onto a coin blank. 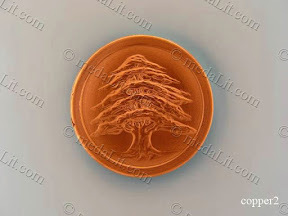 The image on the die is a negative impression of what will be struck on the coin. Read information about making the stamping die here. Copper is a ductile metal, it is soft and malleable; a freshly exposed surface has a reddish-orange color. 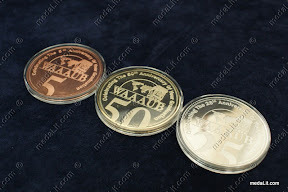 Absi co uses it to cut medals' blanks from 4 or 5 mm thick copper sheets specifically to stamp some semi-proof and 3D medals. Read more about copper in this link. 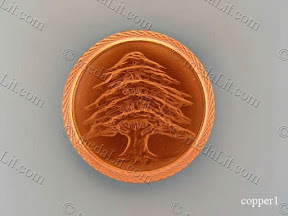 A copper semi-proof medal distinguished by it's reddish color contrasted with gold-plated and silver-plated medals. Epoxy is a thick, hard and clear layer that can also be applied on the surface of a pin-badge to further protect its finish from humidity and oxidization. Epoxy is an exceptionally tough adhesive or bedding material that is activated by mixing two component resins together, just prior to use. The resins combine in a chemical reaction to form a new compound that sets very hard and provides an incredibly strong and durable adhesive bond to the tesserae. This is also often used on Soft Enamel badges as a coating to give it a smooth, domed appearance. 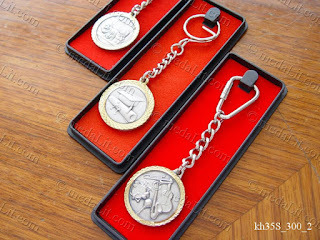 A key fob or key medal is a generally decorative and at times useful item many people often carry with their keys, on a ring or a chain, for ease of tactile identification, to provide a better grip, or to make a personal statement. Key fobs are also known as a "Key Ring" or "Key Chain" in colloquial usage. 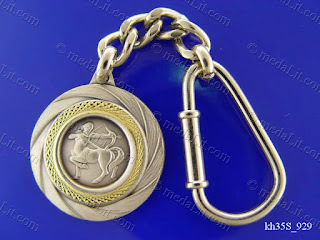 A keychain or key chain is a small chain, usually made from metal, that connects a small item (a medal) to a keyring. The length of a keychain allows an item to be used more easily than if connected directly to a keyring.